This is my first post, using the Windows Live Writer application. It’s a free tool by Microsoft to make blog posts, supporting various blogging platforms beyond Windows Live Spaces. It was able to determine the blog layout and I can now see right when I type this, how it will probably look on the site. Another important feature, which made me giving Live Writer a shot, is the nice image upload feature via FTP. If all goes well, images that I insert here into the editor should be transferred over to my web server and the post in Blogger should refer to the images web URL instead of the local file on my hard-drive. Lets see how it works out :). They have a dedicated web site, an open SDK?? and a gallery with already 97 plug-ins available for download and use with the new Writer tool. I was able to configure the Writer for this blog (using classic Blogger with FTP to push to my servers), with SearchEngineJournal.com (WordPress), but not with ReveNews.com. I think that the problem with ReveNews.com has not to do with the Writer, but the configuration of the ReveNews.com blog itself, which is also using WordPress, like SEJ, where it worked instantly. Okay, but this is not the reason for my post. There are actually two much more significant reasons. Lets start with the first, which is much simpler and explained in no time, compared with reason number two. 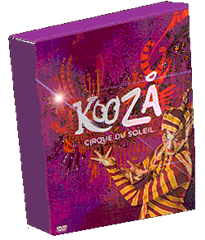 I got today my 2 discs DVD set of the recording of the Cirque du Soleil show “Kooza“. I ordered it on the weekend and paid $12 or so for express shipping. The shipping was really express, which justifies the high shipping charge. The DVD itself cost $29.00. It seems to be expensive, but you actually get a lot of stuff for your bucks, so I’d say that the price is fair. You can only buy it via the Cirque Boutique online as far as I can tell. I stumbled across the DVD by accident. I didn’t see any promotion for it (including nothing on the Cirque web site itself) or anything like that. I noticed it when I compared the DVD offers in the Cirque Boutique for shoppers from the United States to the ones for shoppers from India. Why I did that will be explained in reason two a bit later. Well, that also means that I don’t know when the DVD was actually released, because I didn’t see any preview, announcement or advertisement for it. It cannot be for long be available though, because it is not available via Amazon.com yet. Assuming that the delay for appearing in Amazon.com is the same as it was for the Kooza soundtrack, then it must have been released sometimes last week. I mentioned already that you get a lot for your money. DVD 1 contains only the main show, which is about 2 hours in length. Audio is available in Surround, Dolby Digital 5.1 and DTS 5.1. The show was filmed with 8 cameras during its run in Toronto Canada. 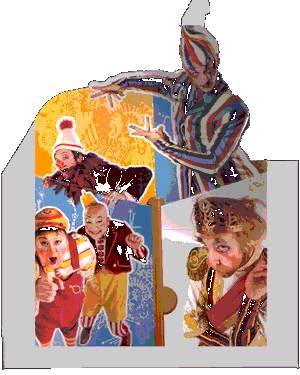 The second DVD contains the entire 47 minutes long documentary “A Thrilling Ride Through Kooza“, which was/is sold separately for several months already. This documentary itself cost already $19.00! Also included are an about 11 minutes long documentary about the Wheel of Death act, some promotional advertisements for other Cirque products and the DVD credits. Altogether over 3 hours of content in high definition and superb sound quality. Subtitles are also available in multiple languages, including Spanish and French. The DVDs come in a custom made box cover, which did not fit in its entirely on my scanner. But you will get the idea, I hope :). Now it is getting serious, so hold on tight and bear with me please :). 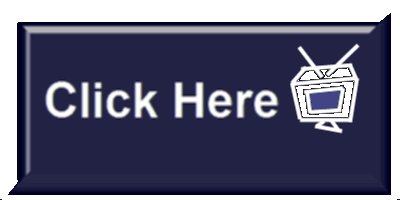 If you noticed and wondered, why many of my past blog posts were changed and include this ugly button where there used to be videos embedded, I will now explain why that I did it and you will hopefully understand and forgive me. 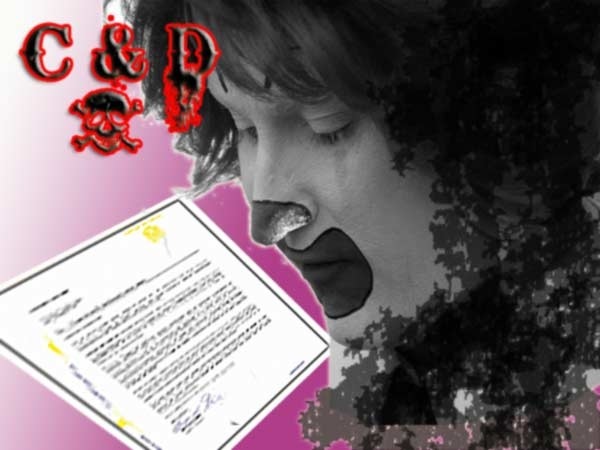 I received a bit over one week ago a Cease and Desist letter by Cirque du Soleil. I am not kidding here, this is real, I swear. You can see the actual letter in PDF format here. See for yourself. It was written politely. They obviously don’t like that I promote their business and help them to make more revenue and more profits (I am still not kidding).?? Before I responded to them, I did contact the Social Media Manager for Cirque du Soleil, Jessica Berlin, who is located in Las Vegas, Nevada. I had contact with Jessica in the past, first through my old YouTube.com account and then through my CirqueDuSoleilGuru account. Jessica manages the CirqueLasVegas account on YouTube and we bumped into each other, because she was literally spamming many of my Cirque du Soleil related videos (no joke). She knew what I was doing, appreciated it, and even gave comments and made suggestions. So I forwarded the email from her colleagues to Jessica, assuming that there was an error made or some rookie at the Montreal office does not know anything about social media and what is going on the Internet these days. Could you please explain to your colleagues what social media is and that they fight an up-hill battle, if they try to prevent people from taking their brand and run with it by force? I do it publicly as a fan and do tons of advertising and more for free and honest, It’s a promotion that you cannot buy for any money in the world. I answer questions of people and cannot remember getting any negative feedback ever. Since I am a fan and not a hater of the Cirque, I try to present the Cirque in its best light possible. I never claimed to work on behalf of the Cirque. I am also open to comments and suggestions, like the one you did for the “Believe” video, where you thought that I was not clear enough expressing that this is not an official Cirque du Soleil released video. If you try to force, regulate and control what people think and interpret by using threats and citing inadequate and outdated laws, two things will happen. people will not stop doing what they do (the genie is out of the bottle), they will only close all communication channels and use the protection of anonymity, removing the option for you to guide and support and to maintain at least some control over the message that is send out to people. What is the point in doing that? It does not make sense at all, personally and also from the business point of view. I understand that there are some ethical limits what some other people do not. I don’t publish full DVD or CD rips of Cirque du Soleil shows for example, although I still believe that this does not hurt you guys that much really, unless the CD/DVD business became bigger than show ticket sales. I stated at my blog and YouTube channel, that the best recording of a show, Multi-Angle, High Definition (HD), 5.1 Surround Sound etc. is no substitute for watching a show live. It’s like watching a roller-coaster ride on TV… it gives you a glimpse, but you have to experience it yourself to get the full package. You are allowed to forward this and also any previous email communication to other folks at Cirque du Soleil, including the two ladies below. I hereby give you officially the permission to do so. I have 10 days to respond to the notice. I will wait with my response until Wednesday and hope to hear back from you before then. It gives you over two working days to discuss this subject with your colleagues internally and to make a decision. I wrote in March an Article titled “Social Media Guide for Big Brand Businesses” for Search Engine Journal, which was well received. I suggest to you and your colleagues to read it. Thank you for forwarding this.?? I think this has come about primarily because of the DVD content that is hosted on your sites.?? I understand your frustrations with this but Cirque has always upheld a very firm policy that no more than three minutes of content is able to be used without having to pay for rights to the footage.?? Usually we have media (both traditional and 2.0) sign a release form for the use of any footage.?? Social media is still relatively new territory for us but we still need to enforce our brand standards in all mediums. I know you are a huge fan and we truly appreciate your help in promoting the shows.?? In order to be able to continue working together, I hope you will respect the guidelines. Sorry for the delayed response, but I was busy. Well, the set 10 days are not over yet, so I am still acting within the accepted limits. 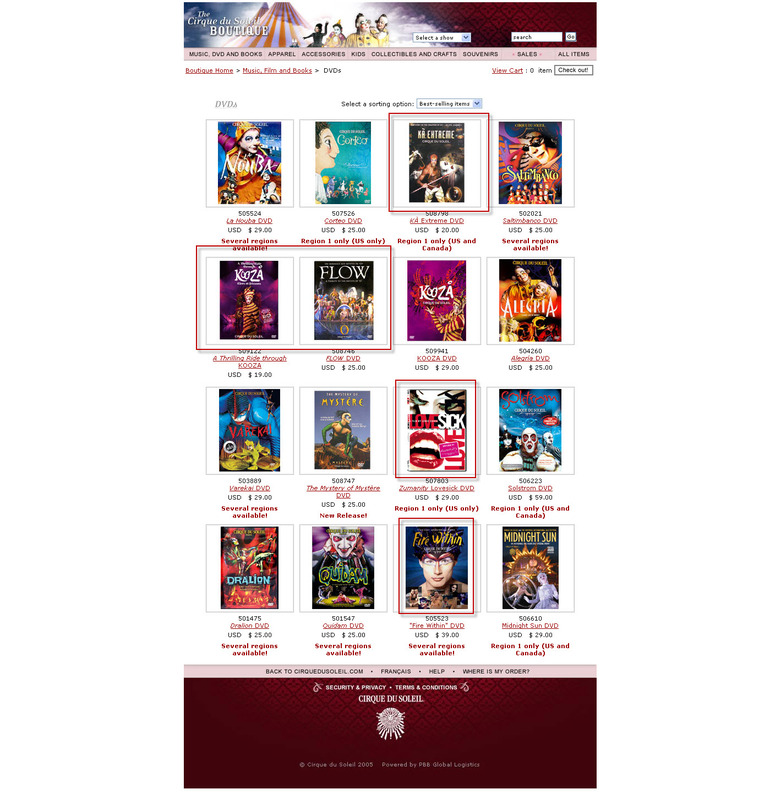 There are no possibly infringing Cirque du Soleil videos hosted or embedded at RoySAC.com or any other web sites that I operate anymore, as you requested. What remains is material provided by partners with whom I am affiliated with, including Amazon.com and MGM or meet the criteria of fair use within the acceptable limits of news reporting and/or expression of my personal opinion, which is still perfectly legal in this country.Let me know, if you have questions or refute my claims for the remaining content on my web sites. I followed the demands made in the C&D by the letter, not a bit more and, I honestly believe, no less either. This makes things look a little bit odd now, because the videos are still there and not removed from the planet earth of course. I did this on purpose, to make a point. I would make a bet that the three minutes length limitation, specified by their internal policies, is based on the use for traditional media, including Television but also high definition ads on DVDs, including their own DVDs. Signing a release form applies also to traditional media (which includes large Web 2.0 publishers), but not to social media (video sharing). The Cirque would have to hire a lot more staff and new servers (web and/or email servers), if they want every guy on the planet who decides to make a fan video from various sources sign a release form (which they must have available in at least a few hundred of the close to 7,000 living languages in the world today, because not everybody who has a computer and Internet access is necessarily also fluent in English or French. Asking a regular guy and fan to only make videos that are no longer than 3 minutes is not only ridicules, but also stupid and to some extend even discriminating. Jessica also seems to be new to all of this. Her well meant, but poorly exercised promotional campaign for the announcement video of the new Cirque show in Vegas starring the magician “Criss Angel” (the spam that I mentioned earlier), seems to confirm my personal assumption. I can only recommend to read my original email once more. This should help with the missing understanding a little bit. I am also open to talks, since I seem to know a little bit more about this subject then they do. Hey, I don’t even charge them money for it. Now to the complained regarding the use of DVD content for some of my videos. The Stuff is already there, not because of me! 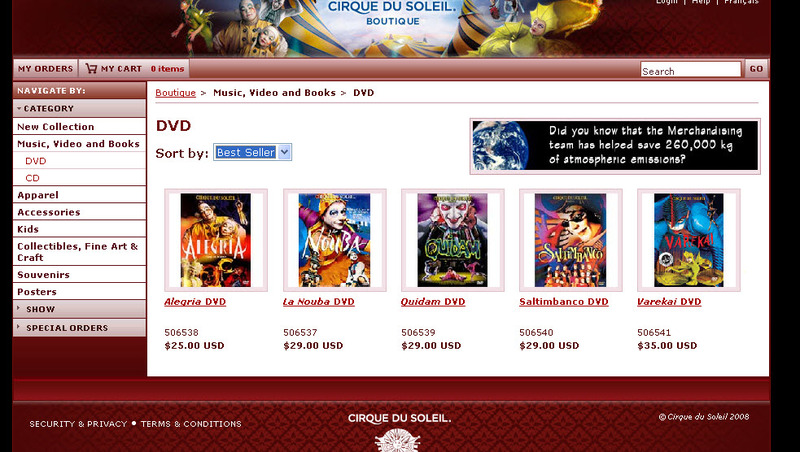 First, ALL Cirque du Soleil DVDs are available for free download in pirated form all over the Internet. Pick your poison, Torrents, Usenet, FTP servers or sliced up into <10 minutes pieces on YouTube. Non of those were my doing. I got tons of requests to publish extensive DVD material, which I refused politely, referring to online stores where those DVDs can be purchased for personal use. This includes Cirque Documentaries. There was one exception. I made one of the documentaries available non-public to a fan in India, who cannot afford to travel to Las Vegas to see the show in Person, Due to the fact that it is a resident show, no show recording of the show is available or will be available any day soon (the show “Myst? ?re” runs for over 15 years and there is still no recording of it). The documentary “Flow” (about the Cirque show “O”) is only available through the Cirque Boutique online shop. Before you are able to show the store is it necessary to specify where the items will be shipped to. If you select USA, everything is fine and pretty much the entire product catalog is accessible. Different story, if you specify India as shipping location. The number of products available?? shrinks significantly. The DVD section is almost empty. Non of the documentary DVDs is available for purchase. So the there is no legal way for somebody from India to get access to this content. I assume that the restriction for India has nothing to do with the Cirque using copyright laws to control distribution in a bad way, but logistical issues and/or the risk of and fear for credit card fraud, which is rampart in Asia and requires some sophistication to reduce the risk to an acceptable limit. I felt sorry and uploaded the video to Google Video and sent the non-public URL to this guy in a personal email. The videos do not appear in any listings or search results on any web site though. Here are screen shots of the site, one with the DVD offerings, if you specify United States as delivery destination and another, if you set the destination to India (btw. when I made those screen shots, is when I noticed the Kooza DVD and bought it right then and there hehe). Yes, I admit that I used show content from documentaries, including the ones that are available on DVD. However, I only did it for shows, where there is no recording on DVD available (yet). I did not publish the documentary parts though, which always made up the larger part of the documentaries. If you are a fan and live half way around the globe from the venue where a resident show is being performed, chances could be slim to zero that the person would be able to ever make it to that show in person and in his or hers lifetime. Know your Customers and Don’t Use Cheap Methods to make a Quick and Dirty Buck! If the person is interested in the shows but not the behind the scenes stuff, trying to sell to him a documentary DVD as a quick fix is not only low, but unethical as well. There are folks (like me), who value the background info of a show, about the creation, the artists and the surroundings. Fine, for them is the DVD and I didn’t publish anything that would deter any of those potential customers from buying the documentary DVDs, on the contrary actually. I mentioned in some of the videos that it contains as source material images from a documentary DVD. I was contacted who were unaware of the existence of such DVDs and who asked me specific questions about them. Often of the nature “which one to buy”, because they only had enough money for one DVD and not all of them, so they wanted to pick the best they possibly could. The folks interested in just the shows got a nice freebie in less than High Definition quality. They wouldn’t buy the DVDs for the documentaries sake of them, are unable to buy a DVD recording of the show and sometimes unable to make it to a show in person. However, some are able to make it and appreciate the video footage to help them with their decision about, for which of the soon to be SIX Cirque du Soleil shows (plus ONE additional Cirque like show, “Le R? ?ve” by former Cirque director Franco Dragon? ?, now on his own, plating at the Wynn Las Vegas), they should get tickets for when they are visiting Las Vegas. Many of the viewers of the videos are actually folks who already got tickets are are excited about seeing a show live and folks who just saw one the shows and are still thrilled and excited to let everybody else know about their excitement via a comment a respective video of that show in YouTube. I am not kidding, check out the comments of the Cirque Videos on YouTube yourself, if you do not believe what I am telling you. REMEMBER! A VIDEO (REGARDLESS OF ITS QUALITY) IS NO SUBSTITUTE FOR A LIVE EXPERIENCE OF THE PERFORMING CIRCUS ARTS! I did not make that up, I really mean it! The Cirque should send me a check instead of a cease and desist letter! Others would probably agree with me on this one. I try to portrait the Cirque from his best side in my videos and try to be as true to the brand as I can. At the same time I am making as clear as possible that I created (edited) the video and do not work for the Cirque. This is important because of content that I use some times, where the Cirque does not own any copyright themselves, yes, content that includes live performances by the Cirque itself (I am not kidding again and won’t start with it at the end ). What I Do NOT Do! I do not publish any video recordings where artists didn’t do their act successfully and fell and might got injured beyond their own pride. I am sure that not everybody is a fan of the Cirque, competitors for example. They can produce stuff as well and appear in search results for “Cirque du Soleil” or any of their show names on search engines and other web sites, like YouTube. I am sure that the Cirque would prefer if that content would be about the Cirque and not the competitors offerings and certainly not content that makes the Cirque look bad, stupid, unprofessional or unable to do their job right. I will send the link to this post to the folks at Cirque du Soleil in Montreal, Canada and also to Jessica in Las Vegas and hope that they will retract their C&D letter and do what I already suggested in my first email (to Jessica only, now published also publicly here at my blog). I will be in Vegas in a few days and hope to get the chance to talk with Jessica of Cirque du Soleil in person. I hope that she will appreciate all my free tips and advice that I provided and starts getting a real grip on this whole social media thing, where she was made a marketing manager for. I won’t give up on the Cirque that easily. And if their is “reasoning” then there will be a solution that will work for everybody involved and can be used by the marketing folks at the Cirque for other instances like this one, where the person on the other side does not happen to be a marketer with experience in the social media space and is also a blogger (a lucky coincidence for the Cirque, I’d like to believe). I think this post makes the top 5 list of the longest posts written for this blog. I didn’t check and will stop here to avoid to be able to be sure that this must be the longest post of them all hehe. p.s. One last thing. Did you notice the new buttons below the post to enter a comment? How do you like it? I think that it is more prominent than the old simple text links. I have not found a way to add Blogger tags to a post yet, but there might be a plug-in. That is the only issue that I encountered with the Windows Live Writer so far. There is room for hope and happiness here :). Next Post: Star Trek, The Experience is Gone!